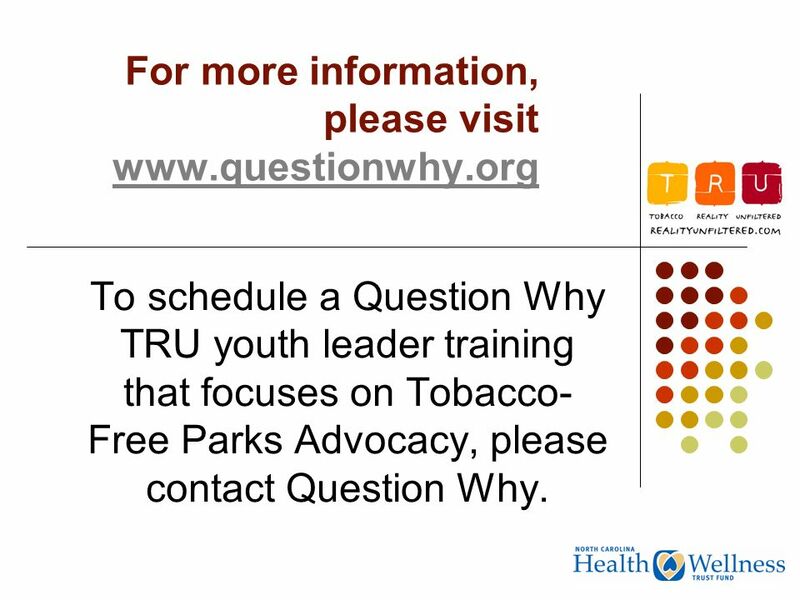 TRU (Tobacco.Reality.Unfiltered) Youth Advocacy and Tobacco-free Parks. 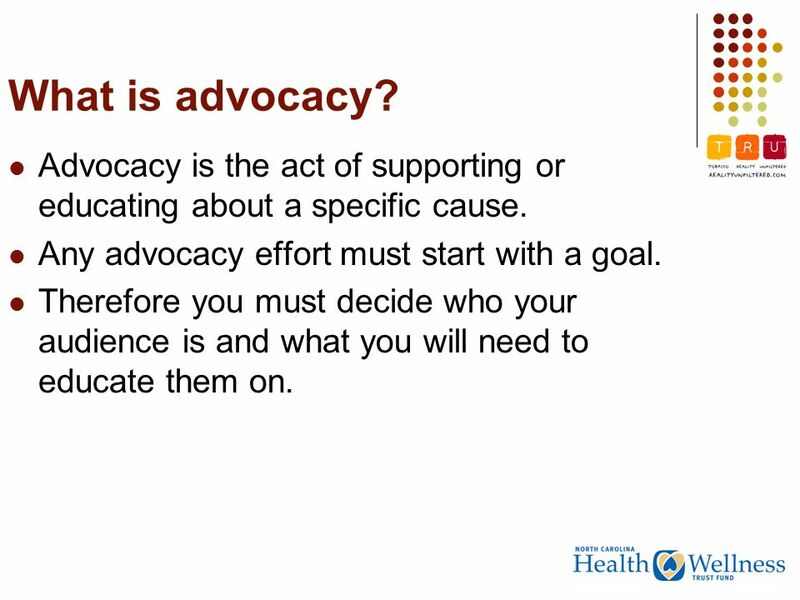 4 What is advocacy? Advocacy is the act of supporting or educating about a specific cause. Any advocacy effort must start with a goal. Therefore you must decide who your audience is and what you will need to educate them on. 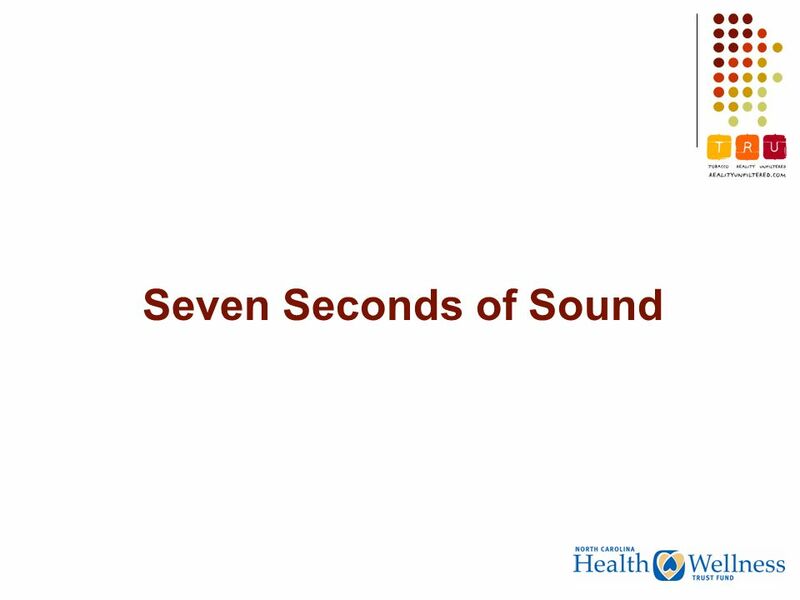 7 Tobacco Free vs. 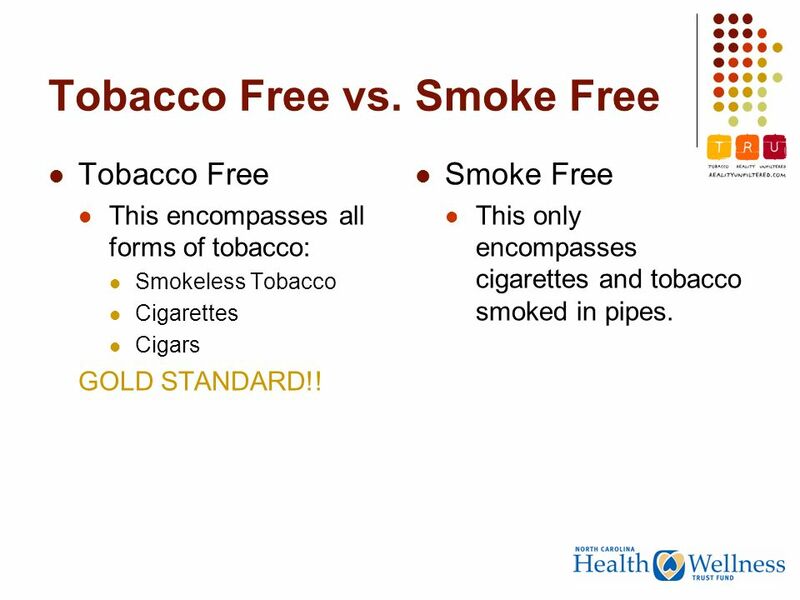 Smoke Free Tobacco Free This encompasses all forms of tobacco: Smokeless Tobacco Cigarettes Cigars GOLD STANDARD!! Smoke Free This only encompasses cigarettes and tobacco smoked in pipes. 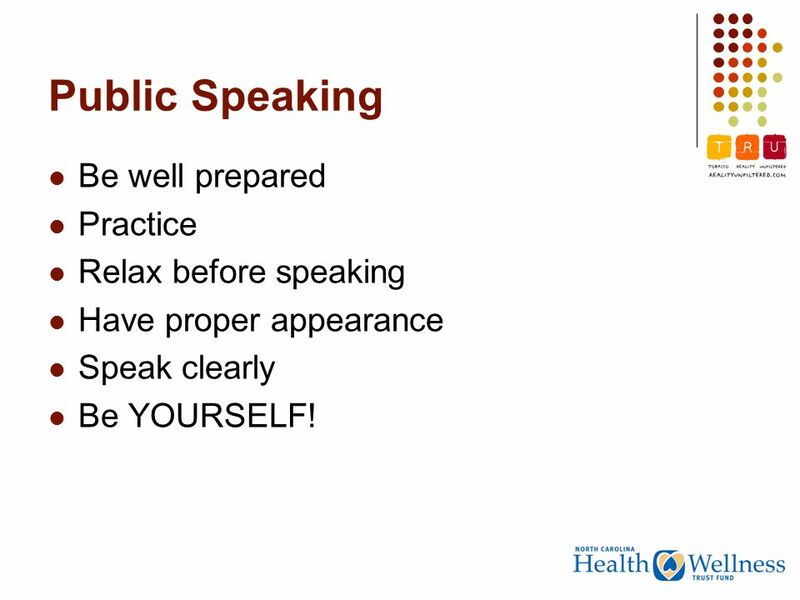 10 Public Speaking Be well prepared Practice Relax before speaking Have proper appearance Speak clearly Be YOURSELF! 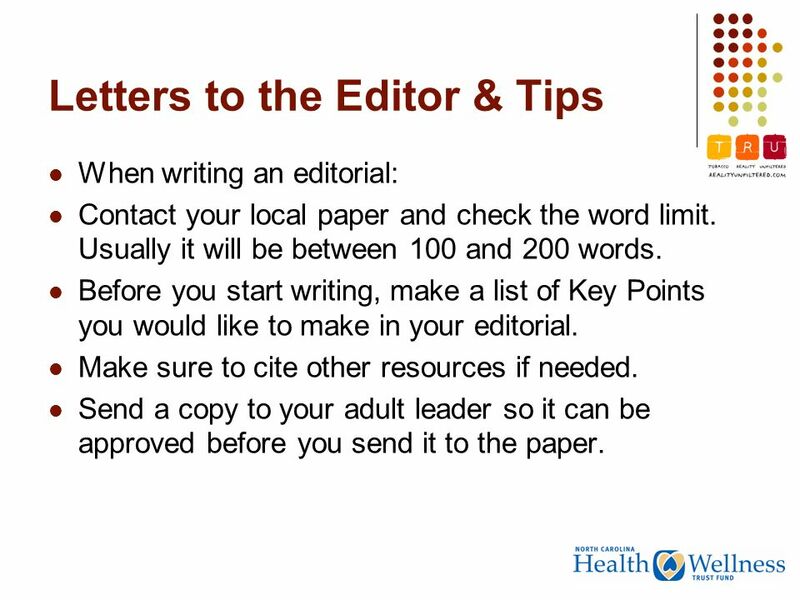 12 Letters to the Editor & Tips When writing an editorial: Contact your local paper and check the word limit. Usually it will be between 100 and 200 words. Before you start writing, make a list of Key Points you would like to make in your editorial. Make sure to cite other resources if needed. Send a copy to your adult leader so it can be approved before you send it to the paper. 14 For more information, please visit www.questionwhy.org www.questionwhy.org To schedule a Question Why TRU youth leader training that focuses on Tobacco- Free Parks Advocacy, please contact Question Why. 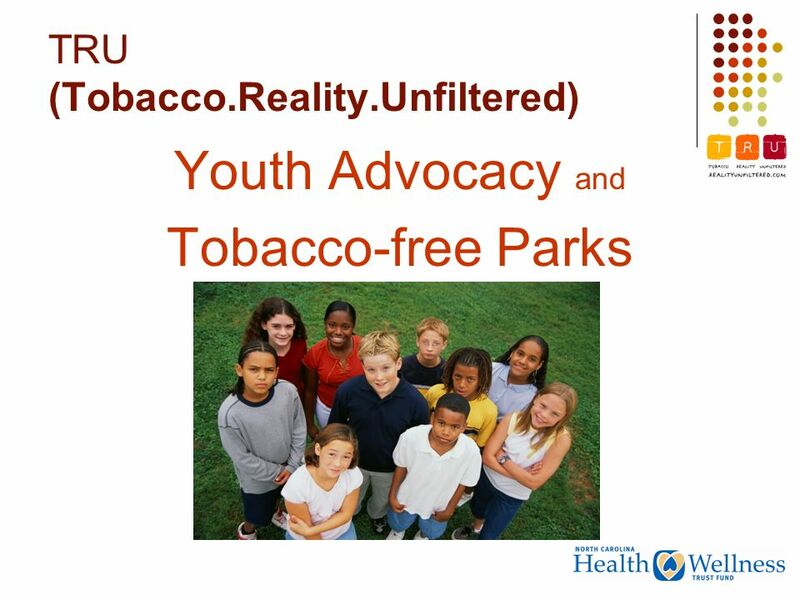 Download ppt "TRU (Tobacco.Reality.Unfiltered) Youth Advocacy and Tobacco-free Parks." What is Advocacy? Minnesota Literacy Council February 4, 2004. Hometown Hikers – Improving Hometown Health Tamara Baker Coordinated School Health Program Coordinator Arkansas Department of Health and Human Services/Division. Tobacco-Free Sports is an international initiative which aims to reduce the harm of tobacco by addressing the relationship between tobacco use and. 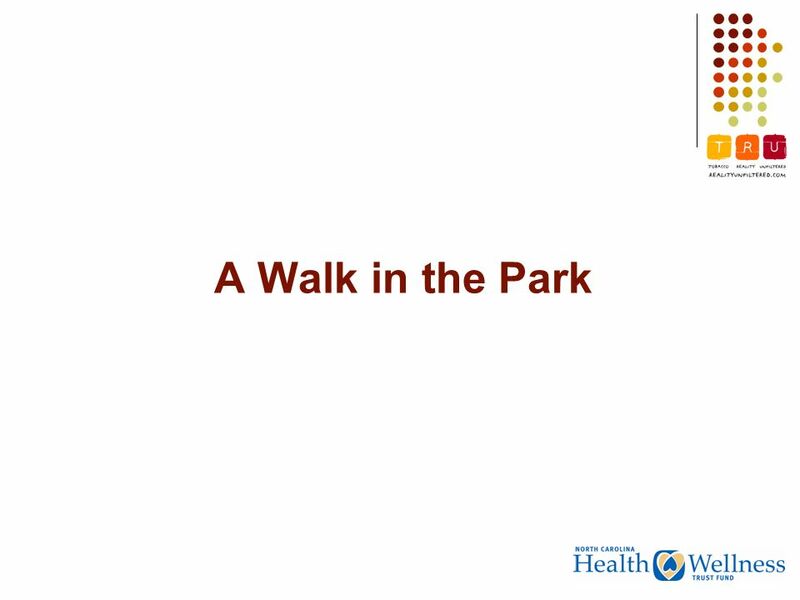 Regulating Secondhand Smoke in Public Parks and Outdoor Recreation Areas WHY? To protect public health, especially of children, from the negative health. Kurt Eggebrecht Appleton Health Department. 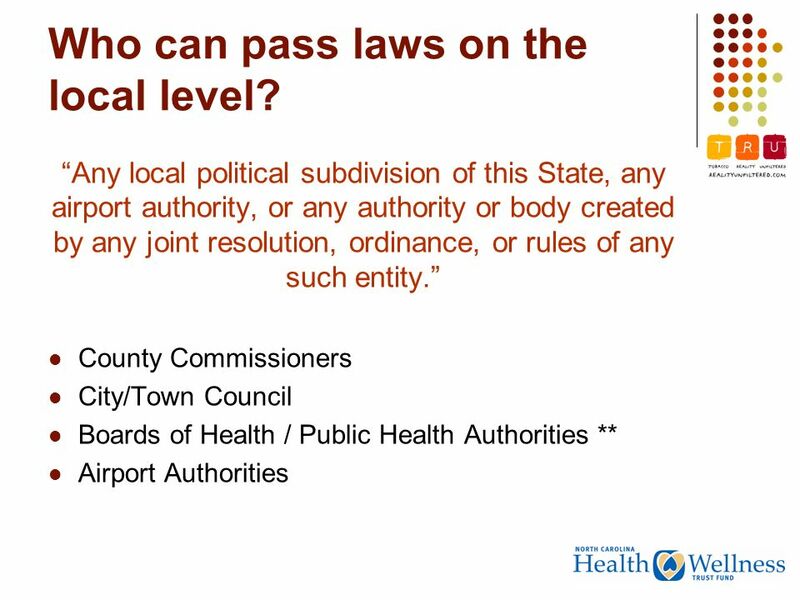 Advocate for policy change to better your community's health How to influence policy from a proactive vs. 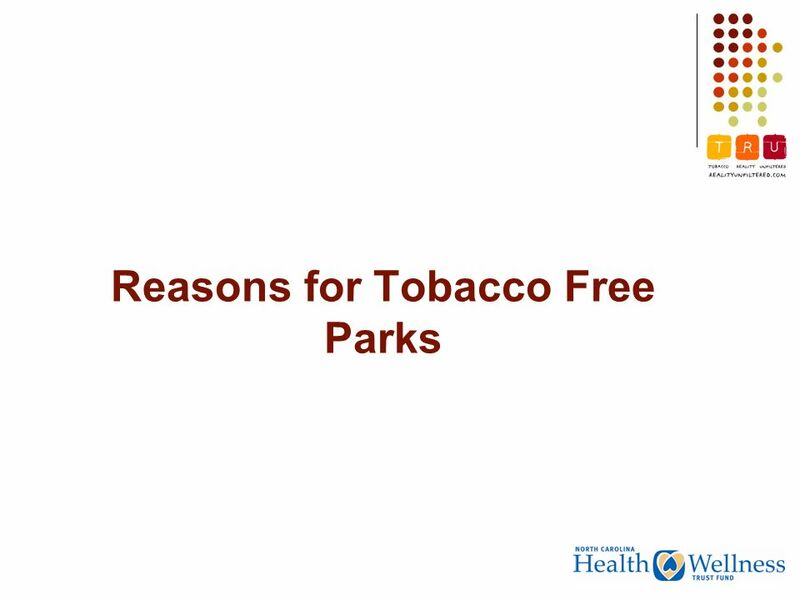 Playing Tobacco Free: Helping Your Community Adopt a Tobacco- Free Policy for its Parks, Playgrounds, and Athletic Facilities Brittany McFadden Tobacco-Free. 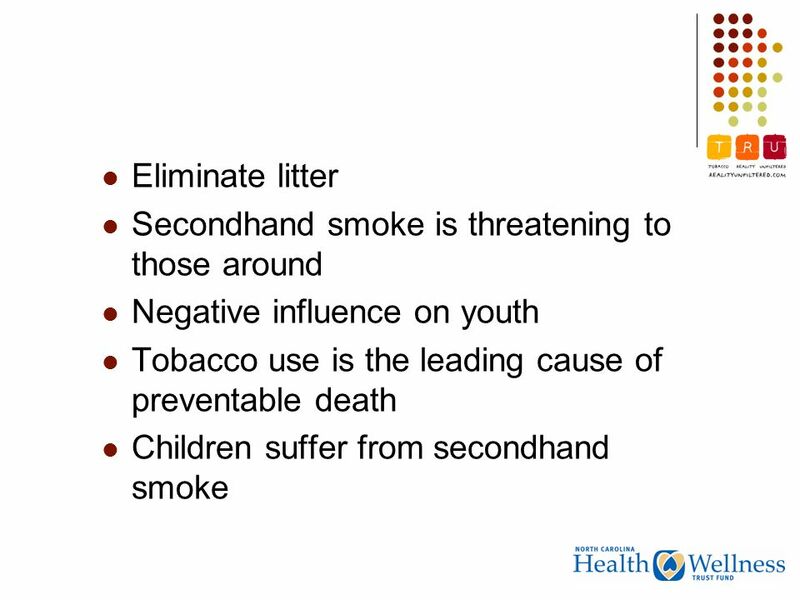 Reducing Youth Prevalence by Limiting Exposure to Smoking and Access to Tobacco. 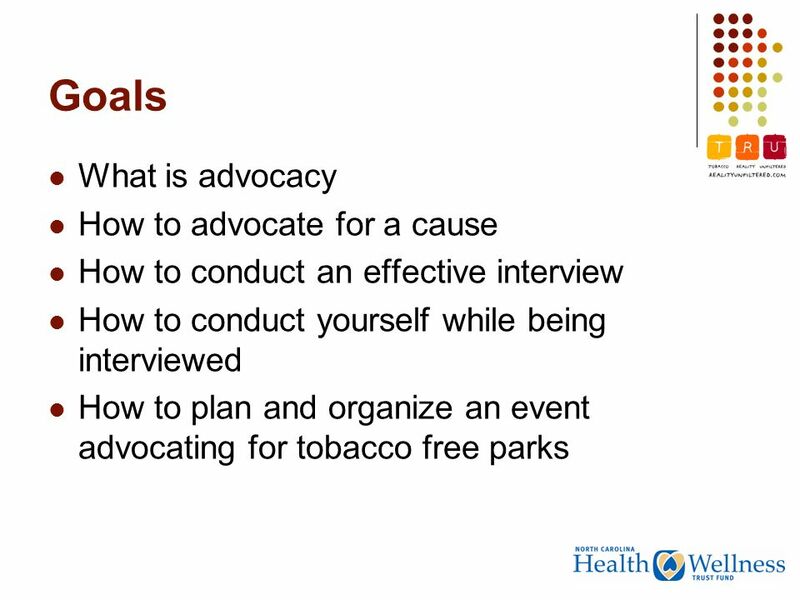 Developing Your Advocacy Plan What Does It Take to Be an Effective Tobacco Control Advocate? 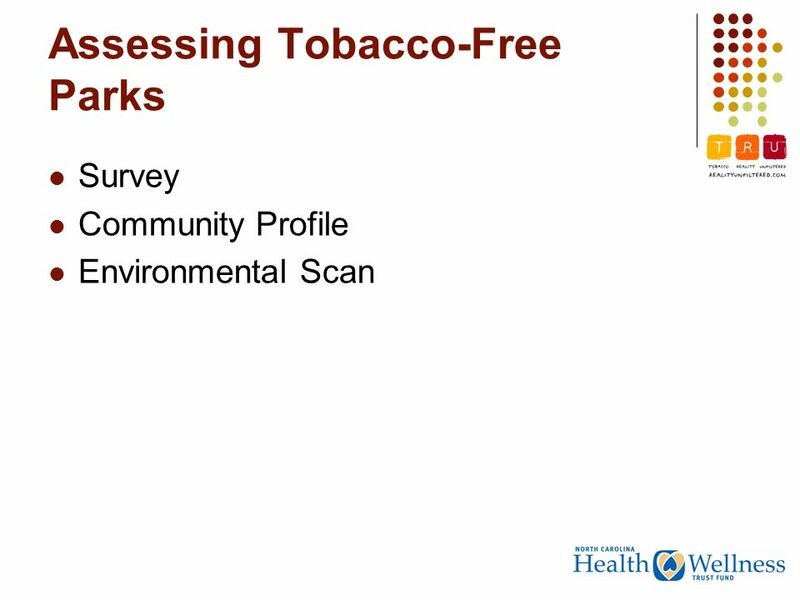 Smoke Free Mecklenburg Good for Health. Good for Business. 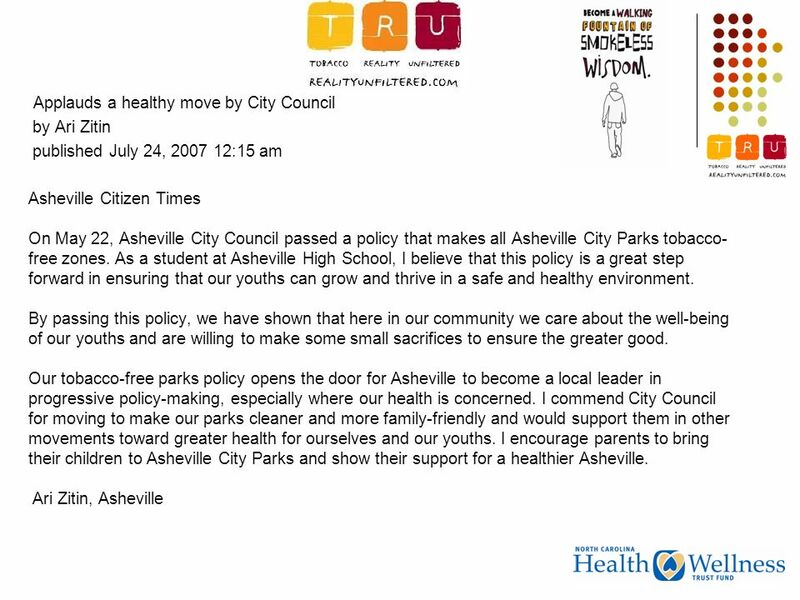 House Bill 2 and current options for local governments Tobacco Free Parks: Moving Forward with Local Authority.